Daisy Alice Mott was born in 1885, the daughter of Charles and Ellen Mott. Her father was the publican of the George Inn in Mucking. She was born in nearby East Tilbury which at that time (before the arrival of the Bata factory) was a small collection of houses on the road to St Catherine’s church and Coalhouse Fort. She worked as a school teacher and in 1908, she married Robert Currie who was a regular soldier in the Royal Garrison Artillery. After their marriage they lived in Gibraltar where he was stationed and where two of their children were born. With the outbreak of the 1st World War, Robert saw active service and in 1916 was reported in the Grays and Tilbury Gazette to be suffering from shell-shock, although this may be another person with the same name. 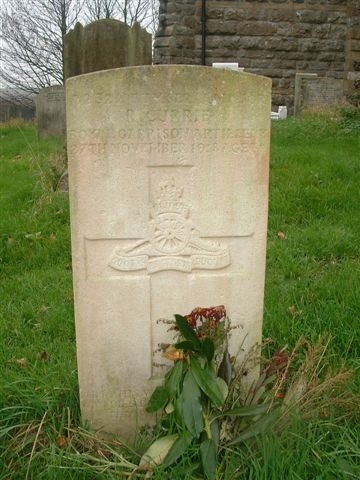 By the end of hostilities, on 11th November 1918, Robert had risen to the rank of Serjeant Major. Two weeks after the armistice came into effect, Robert Currie died in Yorkshire – probably as a result of the Spanish flu epidemic. His wife died five days later in East Tilbury, presumably also from Spanish flu. They are buried together in the churchyard at St Catherine’s, East Tilbury where they have a Commonwealth War Graves headstone. Robert is also listed on the memorial in Mucking church.